I don’t have a single best moment in Journalism, but rather the slow, creeping realization that I was never going to be a journalist. While I appreciate the effort everyone has made this semester, I know beyond a shadow of doubt that journalism is not for me. Since I can’t drop it next semester, I promise I will do the work and get through this class. I am the ISC representative and executive officer of Culinary Arts Club, treasurer and co-president of Invisible Children, secretary and ISC rep for National Art Honor Society, and have participated in Speech and Debate for four years. I volunteer at Relay for Life every year; I am a FIRE crew leader; I am a mentor in the Migrant Education program; I regularly donate blood with the American Red Cross. I am currently directing and acting in the first Foothill play since Spring 2006. My HERO project involves Invisible Children, and I am currently organizing both a hunger strike and a quidditch tournament to raise awareness, though I am also considering classroom talks. I stay after school till five or six o'clock four days a week, working on Migrant Ed, the play, speech, and debate. The next weekend I don't have a tournament is March 20th. I work at my parents' jewelry store during the holidays and special events. I'm taking four AP classes and am a lifetime CSF member. In the copious amounts of free time I have, I go sailing. Next semester, my goal is to say more, not less. I’d like to increase the length of my articles so they are, on average, around five or six hundred words. I plan on doing this by including more focused writing to make it more interesting – specifically, looking at the experience first, the outcome, and the response, not just the outcome. I understand that this will be more difficult when writing about speech and debate, as I have to discuss several different outcomes. If I have to pick and choose, so be it, as long as the article feels fully fleshed out. This semester I took the initiative to switch sections from opinion to news. I had written an opinion article and found I didn't enjoy it as much as I thought I would, so I talked to a member of the news section and organized a switch. Since the news section has more responsibilities - interviews, more sources, less time to write up stories - I thought I would enjoy the challenge. Once in the news section, I started covering speech and debate tournaments, as well as the odd article every now and then about clubs on campus and such.Because I can't write about things I care about in Journalism because I'm in charge of them on campus, I've taken the initiative to point out story ideas to others. This has led to more coverage of Invisible Children, for example, which is a small club, as well as my HERO project, and I feel that it deserves more exposure. Child soldiers have been forced to kill their families, destroy their villages, and have been exposed to such violence and bloodshed they find it next to impossible to readjust to normal Ugandan life. Invisible Children is trying to help end the war in Uganda and rehabilitate those affected by the conflict, including child soldiers. Unfortunately, not enough people on campus know about the organization, nor do they care to find out, which is why I am pushing for more coverage of Invisible Children events, like the hunger strike and the Quidditch tournament I am currently organizing. Reaching from the Pyramid of Success, I feel I have demonstrated resourcefulness. It appeals to me personally because I believe in efficiency and productivity, and the best way to accomplish those goals are through using what is available at hand to get the job done. When I go to a speech or debate tournament or any other event that had to be pre-approved by the Foothill administration, I always try to get a story out of it. (Sometimes, because I am in charge of said event, I am not allowed to cover it. Examples include the diabetes fundraiser, Pride Day, and every tournament I have attended this year. I firmly believe that multi-tasking (covering events I would go to normally) maximizes efficiency and saves time. Because I have participated in speech and debate for four years, I have intimate knowledge of how the tournaments work, and can use that to help write an article. If I were covering a LAN party, for example, I would have no idea where to start - I don't even know what that stands for. By writing about what I know, I am able to share that experience and information with others, something that would be less achievable if I were not covering tournaments and maximizing the resources available to me. High school journalism publications have all the rights that are accorded to publications such as the NY Times or the Chicago Tribune, though they do have some restrictions. The Foothill Dragon Press, therefore, has the right to the first amendment, which guarantees freedom of speech and the press, which means that the Dragon Press, or any writer of the Dragon Press, has the ability to say what they want as long as it complies with law (examples of written materials being withheld can be seen in prior restraint). High school students had their first amendment upheld in the supreme court case Tinker v. Des Moines Independent Community School District. Two students wore armbands in protest of Vietnam, and were suspended, as the school district had banned wearing peace armbands. The court ruled in favor of the students, as wearing the armbands was a political message, and the district could not abridge their freedom of speech. This applies to high school journalism because it strengthened the protection the first amendment gave to students on campus.However, that protection was weakened later, in Hazelwood v. Kuhlmeier, when a publication tried to run a story about pregnancy. The principal refused, and the paper sued. The supreme court ruled in favor of the district, because they believed schools did not have to sponsor a story or article. The principal did not infringe their right to speak about pregnancy, but rather the forum in which they wanted to express their thoughts about pregnancy. This ruling reduced the amount of protection a high school publication could receive from the first amendment.Ultimately, public schools can only censor a school-sponsored publication, not a "public forum," so the Dragon Press enjoys freedom of the press. Speech and debate victorious at tournament: I consider this to be an example of my best work because I mention every award Foothill received, but I also supplemented it with explanation for what award each event was received in, as well as what that event entailed. The descriptions enhance the meaning behind the trophies, which is exceedingly important, as most of Foothill is unclear on what exactly goes on in rounds at speech tournaments. Speech and debate team takes 4th at tournament: I feel this is a balanced, fair view of the tournament - while the speech team is happy to have done so well, I also pointed out that it did not run as smoothly as was hoped, due to problems with food and judges. I made an effort to remain unbiased, and used a lot of quotes to provide basis for the allegations about food and judges. 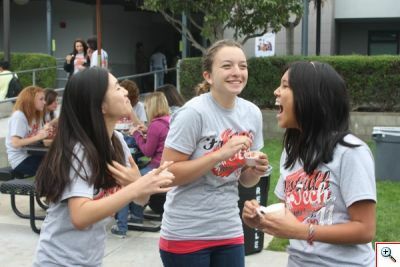 Senior gives back with diabetes fundraiser: Diabetes is a very real problem, and not enough people are aware that people at Foothill have it. Since Madeline didn't have a soundsystem to spread her message, I tried to share her voice through the Dragon Press. It is supplemented by research, which is strengthened by quotes from Madeline, who has type one diabetes. I am extremely proficient when it comes to adding hyperlinks in articles. I can take adequate photos, though I'm not sure how to change exposure, white balance, and the more complicated functions.